with tiki cabana wet bar for guests to entertain at. Across the street there are beachfront picnic and BBQ. Poolside BBQs on site. Quiet, quaint cottage. Family friendly. Some pets accepted, ALL pets must be pre-approved by us prior to booking. Please be as specific as possible including breed or closest breed type, including size, age, temperament, etc. Pets not pre-approved will not be accepted, no exceptions. Pets are not allowed on Siesta Key Beach, we have plenty of outdoor areas to sit with your pet and nice neighborhood for walking them. Pet friendly dining available in Siesta Village. We are located in a neighborhood called Sarasota Beach. We are at Siesta Key Beach access 11. Just a block north of the Siesta Key Beach Pavilion. Owner and operator of the Beach Place since 1999. I have been on Siesta Key since the early 70's and know Siesta Key and the surrounding areas very well. I am happy to offer dining and site seeing tips depending on our guests interests. I can also offer suggestions for day trips. I am available to help our guests almost any time since I live on site. 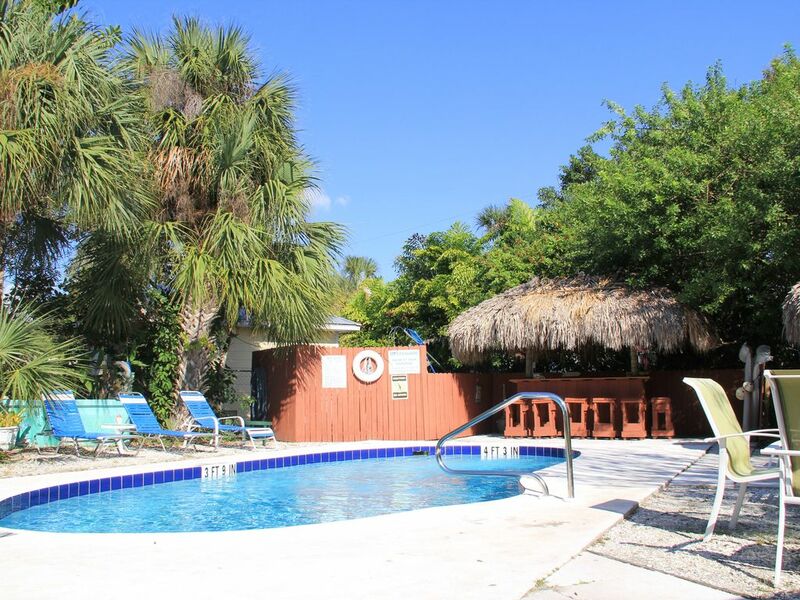 The Beach Place Starfish Cottage been available as a rental since the early 60's, I am interested in preserving Siesta Key's "Old Florida Charm" so that visitors may experience the type of place that made Siesta Key famous. We are one of the few original rentals still operating just steps from our world famous sand. Some pets accepted, please check with us prior to reserving if you are traveling with a pet and let us know what type of pet you are traveling with. Please be a specific as possible about size, breed, etc. Unfortunately pets not pre-approved can not be accepted. 1 Bath has stall shower, toilet and sink. We are just across the street from Siesta Key Beach. 30 second walk to put your feet in the sand, has peak of the Gulf, Sea Oates and entrance to Siesta Key Beach at access 11. We provide clean linens once a week and towels when ever you need. Onsite washer, provide your own soap please. One spot just a few steps from your door. Additional parking can be arranged. There is a charge for more than one vehicle. Please inquire if you need additional parking. Wireless Internet, also available for poolside surfing. Burgundy colored full sofa sleeper, one upright living room TV chair, metal and glass coffee table, two end tables with lamps. Bronze color efficiency size dishwasher. Full set of pots and pans, plenty of dish ware and utensils. Full kitchen very well stocked. Double sink, plenty of counter space. Four person wrought iron dining set. Basic Comcast Cable is included. We have some interesting tropical plants on our property. Rentals near by, discounted trips can be arranged. Around the pool and tiki bar, front porch on this cottage with small table and two chairs. Outdoor heated pool surrounded by tropical gardens. Heated pool with tiki cabana wet bar for guest to use. Beach chairs, towels and bikes, beachfront and poolside BBQ and picnic areas, five minute walk to tennis courts, beachfront volleyball courts, and beachfront childrens playground. Free Wireless Internet. Complimentary laundry facilities. Parking for one vehicle included, extra parking available with a nightly charge. If you are looking to be just steps from the beach at a reasonable cost then this would be a place to look at! Its also just minutes away from restaurants and cool places to hang out. The inside is a little dated but very clean and well maintained. I didn't use the pool or grill but they appeared to be nice as well. Thank you for taking the time to write about the Beach Place. I'm glad to hear you enjoyed your stay. Hopefully we'll see you for another Siesta Key vacation. Great little cottage with great location, just a couple of strides across the street to Siesta Key private beach access! We had a great time, cottage located close enough to walk to the Village if you like a little walk before and after dinner. Owner on site and attentative to the needs of guests. Only down side was bathroom shower a little small to move around in. Roxanne, thank you so much for taking the time to write a review for the Beach Place. I am so glad to hear you appreciated our location and easy access to beach and village. Sorry to hear the shower was a bit snug. The green Dolphin cottage shower is larger, if you come down again you may want to consider that one. I have been toying with the idea of putting a hot & cold enclosed outdoor shower up for guests. True old Florida outdoor living at its best!! I hope we see you both again soon. Enjoyed the stay. Place was clean and had a nice comfy feeling. Leslie had a available cottage so we got to check in a day early. Leslie and her sister make you feel welcomed. Loved the pool and very clean. Location was perfect we brought our bikes spent most of our time in the village and on the beach. Plan on going back next October. Thank you for taking the time to write a review about your stay with us. We totally enjoyed meeting and talking with you and look forward to seeing you again when you are ready to head south. Please, don't be a stranger and keep in touch. Quaint cottages, very clean and management very knowledgable about the area. The property was right across from the beach. The property was very nice and very clean. Management was super knowledgeable of the area. Thank you for taking the time to review the Beach Place. I am happy to hear you enjoyed yourself and were pleased with the recommendations I made for dining. Your pup is welcome to stay anytime, no problem. When you left you couldn't even tell there was a pet in there. I hope you will consider staying with us again. Thank you again for choosing the Beach Place. It's great to be this close to the beach entrance, and not the main one. We enjoyed our stay, we were lucky with weather and the red tide. Perfect if you want to be at the beach early and all day, we would stay again. Walls are thin, a bit too much noise from the couple next door, but I think it was more their yelling, but the walls were also guilty. Having to remove the towels and trash at the end of the stay is humorous considering there was a 60 dollar cleaning fee. Thank you for taking time to write a review for the Starfish Cottage. I'm very glad to hear you enjoyed your stay and that you appreciated the cleanliness of our cottage. I wish you had said that you were not comfortable on the sheets. We have just purchased some new linens and you may have gotten a older set. I have been asking housekeeper to make sure the sets are in good shape and not getting scratchy. I would have replaced your bed linens for you, no problem, we have tons of sheets and lots to choose from. Sorry about the noise, this is a older cottage and yes, sometimes you can hear guests. Over the holiday weekend you did have a family next to you with young children. I am not sure whether there is a fix for that, that cottage was built in 1953 and portions of the walls are concrete. I should do some research. We do have another cottage that is a stand alone, so if you decide to stay with us again, we should put you in that one. As far as the trash and dirty towels is concerned. This is really more for guests that stay longer than a day or two so that the trash doesn't build up and bring the bug population Florida inside. We like guests to know that they can remove their towels so that they do not pile up, we offer clean towels when ever a guest needs them. The cleaning fee does not cover the cost of servicing the cottage between guests. It's actually about half since I make sure the housekeeper is paid a livable wage. You left our cottage is lovely shape and I thank you for that. Thank you again for staying with us and I hope you will consider us for a future stay. Museum, Van Wezel Perfoming Arts Hall, Opera House, Theatre for the adults. Jungle Gardens, Save our Seabirds bird sanctuary and Mote Marine Aquarium for children. One hour to Tampa theme parks, two hours to Orlando. Free Siesta Key Trolley picks up at our corner and runs from 8 am to Midnight traveling from North to South Villages and also down to Turtle Beach. We are a pet friendly property, some breeds restricted. Pets must be cleared first. Please do not make a reservation without pre-approving your pet. Pet owners - no matter what type of pet you have, your pet will not be accepted if not approved first. Pet Fees apply if you are traveling with a pet. Pets under 25 pounds - $50, pets over 25 pounds or cats $70, plus tax. A separate pet damage deposit is required - $200, pet damage deposits are refundable at check out. Pet fees and damage deposit is payable upon arrival by check, cash or credit card. Additional 5% fee for using a credit card. State and county taxes paid on arrival. Guests under 25 must be accompanied by a adult.